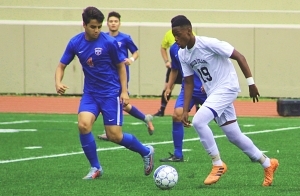 The 2018 DeKalb County soccer season came to an end on Saturday as Druid Hills and Tucker were knocked out in the quarterfinals of the state playoffs. The No. 4 ranked Druid Hills Red Devils dropped a very physical 4-2 decision to No. 7 ranked Northwest Whitfield at Hallford Stadium on Saturday. Druid Hills (11-10-1) played a man down for over 60 minutes of the game and had played Northwest Whitfield (16-4-1) even until 17:45 remaining in the game when Anthony Ramirez headed in a goal to give Northwest Whitfield a 2-1 lead. Northwest would get two more goals in the next nine minutes from Fabian Avarro and another header by Ramirez to make it 4-1 with 8:57 to play. The Red Devils kept playing and Cantrice Hart scored with 1:53 to play and almost scored again before Northwest Whitfield was able to run the clock out for the victory. Druid Hills scored in the first 21 seconds as Nate Jackson got the Red Devils on the board quickly. Northwest Whitfield answered right back less than two minutes later on a Carlos Martinez goal to even the score at 1-1. The two teams battled up and down the field in the physical contest to a tie at the half. It would take Northwest Whitfield just over 22 minutes of the second to finally take advantage of the man advantage. Druid Hills’ freshman goalie Ruben Angeles had a much better game than appears with the four goals allowed as he made big save after big save throughout to keep the Devils in the game. He would finish with 12 saves on the day. The Tucker Tigers played the No. 3 ranked Chattahoochee squad tough through out before falling 3-1 in their Class 6A quarterfinal contest on the road. The Tigers (11-8-2) kept the contest close trailing just 2-1 before Chattahoochee (13-3-3) scored the game-clinching third goal to put the game away.